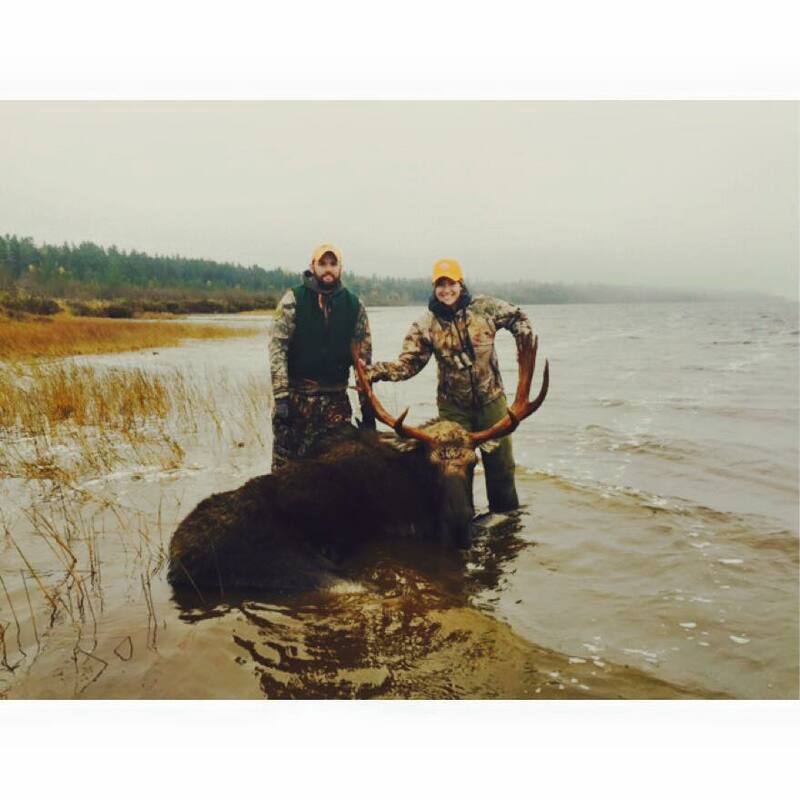 Maine Moose Hunts are the big game hunting adventure that many dream of for a lifetime. There is nothing more exciting than a rut crazed bull thrashing through the brush and swaying into a cow call. As you prepare to take your shot, your adrenaline will rush like never before. Guiding Moose hunters is our favorite and our specialty. 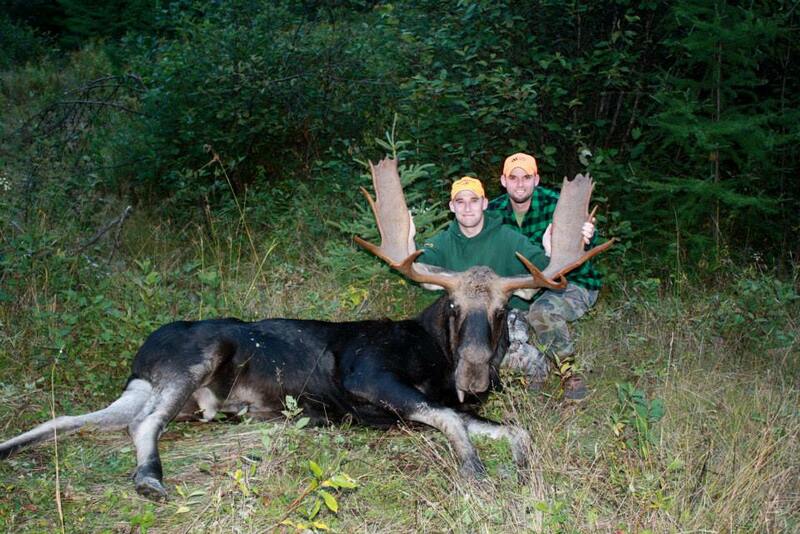 We pride ourselves in our ability to put clients of all skill levels onto Trophy Maine Moose. We offer moose hunts in Wildlife Management Districts (WMD) 19, 27 & 28. These zones are located in eastern Maine, near the New Brunswick border. Eastern Maine is prime moose habitat. This remote region of the state is loaded with swamps, spruce bogs, beaver flowages, industrial timberland, lakes, and streams. Moose in this area have an excellent balance of diverse forest types offering young hardwood forest types providing abundant feed, cool dark bedding areas for those hot summer days, and winter cover and feeding areas. These areas are covered with gravel logging roads that provide great access, nearly all of which is owned by forest management companies and open to the general public. There are many methods that work well for hunting Moose in this vast remote country. Calling can be very productive and exciting, especially during the peak of the rut. Bulls will readily come to calls and often make their presence very known! In addition to calling, spot and stalk, quietly canoeing waterways and flowages, and sneaking along recent timber harvest areas and bogs is also very effective. A permit is required to hunt Moose in Maine. Each year Maine’s Inland Fisheries & Wildlife allocates approximately 3,000 permits to lucky hunters through a random lottery process. Hunters can apply each year until Mid-may and the drawing takes place in Mid-June. 6-day guided moose hunts are offered to lucky permit holders. Throughout the year your guide is always scouting for moose. Prior to the season Moose are observed and areas with larger bulls are heavily scouted, giving you the best chance for success. After you’ve harvested your trophy your guide will field dress and remove the animal from the woods. Your guide will accompany you to the tagging and registration station and to a local butcher if you choose. Once the animal is at the butchers, you will be responsible for meat pickup and butchering costs. Moose hunts are offered without lodging. Each day of the hunt, snacks, lunch and Guide Coffee will be available. For more information please see our Lodging & Accommodations page. For rates, available options and booking information please see our Guided Trip Rates page. Hunting license not included and can be purchased from Maine Inland Fisheries & Wildlife. Come hunt Moose in Downeast Maine!! We look forward to providing you a big game hunt of a lifetime.